We’re really excited to announce the beta-launch of Ashop.me, our brand new Marketplace showcasing our merchants’ products. One of the main bits of feedback we’ve been hearing from eCommerce merchants is how challenging it can be to generate quality traffic and boost sales. Meanwhile, sellers on marketplaces like eBay and Amazon say they’re fed up with skyrocketing listing fees. So in response to this, we developed the Ashop Marketplace. The Marketplace puts merchants’ products in front of targeted customers that are looking to buy. Ashop.me has one of the best teams of online marketing experts behind it. They’re putting real media spend and optimisation behind the listings. So our merchants’ products appear at the top of critical online marketing channels. Completed sales made through the Ashop Marketplace incur a straightforward 9.95% commission fee. We invest this revenue straight back into advertising and marketing to keep driving more traffic and sales. Merchants, you can list your products on Ashop Marketplace by ticking the ‘List on Marketplace’ box in the ‘Product Details’ page. 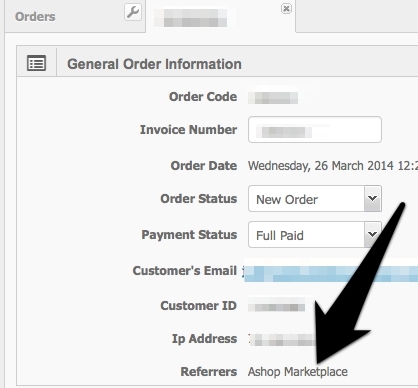 You can see which of your completed orders are Marketplace sales under the ‘Referrers’ in your ‘Order Details’. Ashop.me is still in beta - and we’d love to know what you think. Whether you’re a shopper or seller, we’re eager to know what you think. Drop us a line.